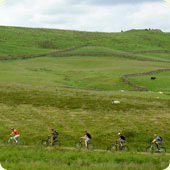 The Kentmere Loop, Staveley - Cumbrian Trail Guides - Mountain Bike Cumbria - beautiful trails and information from throughout the Lake District and beyond! It's a great ride with mixed terrain and a range of technical grades. A varied ride that should be enjoyed by most bikers. I'd give it an intermediate grade and as a guide it shouldn't take more than a couple of hours unless you're picnicing! Enjoy! Starting at Staveley use the cycletrack to head west towards Ings. As you pass the Little Chef on your left keep your eye out for right hand turns, there'll be two of them quite close together and you need to take the second one at Hill Farm. This lane soon gets steep setting the mood for things to come. Enjoy it, it's the last bit of Tarmac you'll see for a while! Keep eyes right for a steep bridleway, follow this until you pass High House Farm. This ascent morphs with every Lakeland downpour, so expect it to be technical. Things level out towards the farm and you can gather a bit of pace. Take a left at a junction shortly after the farm and then switch off the brain for a couple of K's and enjoy some easy green lanes. At the end of the lane take the gate on the right across some moorland following the obvious line until the crescendo & a ford through Park Beck. There are a couple of gates to negotiate and usually a little bit of soft ground but it's not too testing, a bit like Junior Kickstart. After the ford go through a gate up a very short, very steep hill, before following the obvious path. Getting tired of the cross-country? Follow the path through a couple of gates and crest the hill as the track widens and becomes more rocky. Space yourselves out and enjoy the descent! Why space out? There are three gates on the descent and if you share the duties everyone gets a better ride. The descent isn't super technical, but if your not paying her the attention she deserves she'll throw you. Ride it fast, but use the force when picking your line! Yes, I'm afraid so, but by now you'll want something easier. Head right towards Kentmere church, drop down the hill looking for a sharp right and a steep climb. Hang left at the top and enjoy the country air. Head right up towards Longsleddale. The climb's nice and steady, not too technical followed by a harsh, if brief, Buckaroo descent to a gate & staying on and getting down it is test enough of your man (or woman) hood, don't worry about style. At the gate take a right climbing grassy moorland towards Kentmere again. The hill does end (eventually) and takes you on an obvious descent all the way back to Staveley. This trail has been viewed 49854 times! You are looking at an article within the geoarea of E8, the links below are related to it.